Its name refers to a diverse area where you can find everything you want, as it means “market”, and that is quite true. 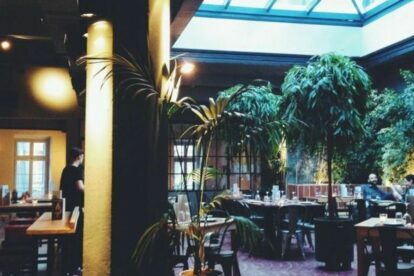 The “Fouar” is the place where the aesthetic of the ’60s meets Asian cuisine and contemporary art, located at the first floor of a protected industrial building with neo-classical references on Mitropoleos street in Athens. In its leafy atrium with the sunroof, you can taste outstanding dishes influenced by Asia. Right next door you will see the bar where you can taste nice cocktails and listen to good music. This space also hosts different types of parties every week that will give another dimension to your amusement. Finally, in the gallery space of the “Fouar” you can visit and explore contemporary art exhibitions by young visual artists, architects and more, starting or completing your day in the best way. Isn’t it nice when you can have so many different influences at once? That’s exactly the reason why I liked that bar-restaurant. In there I can never be bored. So, what are you waiting for? Check the current events on the Facebook site or just trust your instinct and spend a special evening or night there in the center of Athens. Tip: If you want also to eat maybe it’s better to make a reservation!